Today at church, the talks on tithing in Sacrament meeting went well with the lesson in Relief Society: work and personal responsibility. I left with an increased understanding of both principles, and gratitude for the good examples of those around me. In Relief Society we talked about how it is easy to view God's declaration to Adam, "In the sweat of thy face shalt thou eat bread," (Genesis 3:19) as a punishment. But one of the sisters mentioned how the choice of Adam and Eve to partake of the fruit of the Tree of Knowledge of Good and Evil and thereby leave the Garden of Eden was essentially choosing progress. 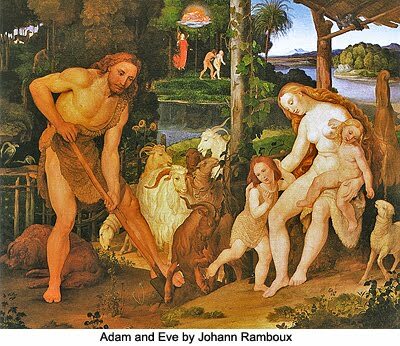 In the Garden of Eden, with all things provided for their sustenance, Adam and Eve could not have children and could not experience joy. Although they would both have to work hard just to get by outside the Garden, many opportunities and blessings were opened to them that they would not have had inside the Garden. The Gospel Principles manual linked to above (where it says Work and Personal Responsibility) states, "Work is essential to each of us for growth, character development, and many satisfactions that the idle never know." "Later I saw that same estate, yellow in grain, green in lucerne, white in cotton, seemingly unmindful of him who had claimed it. "My dear brethren and sisters, I testify to all of you that tithing is indeed a great blessing and a law for our benefit. Let us draw our family circles around us and again read the promise that the Lord testified came from the Father, a promise none of us can afford to be without: “Bring ye all the tithes into the storehouse, that there may be meat in mine house, and prove me now herewith, saith the Lord of Hosts, if I will not open you the windows of heaven, and pour you out a blessing that there shall not be room enough to receive it” (Mal. 3:10)." Work is necessary and important, but it is essential to keep in mind the source of our blessings. Living the commandments and paying an honest tithe are ways to show gratitude to God, and the blessings we are promised for doing so are real and many. Start early. If you teach your children from an early age to do household chores, it will be a normal part of their lives, and it won't be such a "chore" to assign them responsibilities. Make it fun. Little children like to help. Take advantage of this! 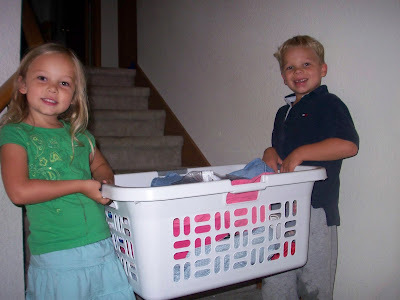 I remember my mother starting my sister and I folding washcloths and hand towels when we were preschool-aged. It was enjoyable, especially because we were "helping" Mom, who was working alongside us. Kill two birds with one stone. Working together as a family offers a great opportunity to get to know each other and to talk about important things without it feeling like a lecture, especially to adolescent kids. There is more than one "right" way. By this, I mean that just because you have always done a certain task a certain way, doesn't mean that it's the only way it can be done. Be flexible and let your children figure out their own way to fold their socks. It won't be the end of the world if it's not how you would have done it, or if it takes longer than it might have otherwise! One of my absolute favorite bands is Lifehouse. The lead singer, Jason Wade, has a unique voice that I find very soothing. Overall, their music has a rock/pop feel to it and their lyrics are beautiful. Additionally, I sometimes cannot tell if their songs are worshipful or written to a lover. The words of several of their songs show a deep respect and adoration that could easily be applied to both God and spouse. The video (embedded below) depicts the destruction we can cause in our relationships (even inadvertently) by our words or actions - by showing various items exploding. As the singer promises to do "whatever it takes" to fix the problem, though, everything is healed and goes back to normal. We can all relate to doing or saying something that accidentally hurt someone close to us. The important thing to remember at such times is that we CAN change! Through the power of the Atonement of Christ, we can (a) be forgiven for our mistakes and (b) repent and change our ways. Yes, it takes effort, but it is worth it.